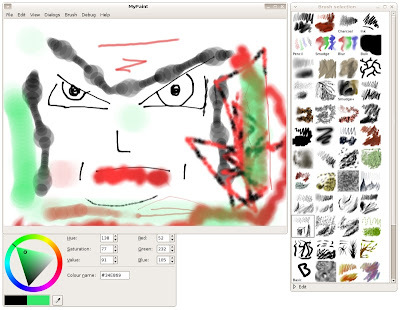 MyPaint is a fast and easy program. It supports pressure sensitive graphic tablets and comes with an easy-to-use brush collection. There is a complex interface for creating own brushes, focusing on brush dynamics (changes with speed, pressure, randomly). For Ubuntu users, click here to get the Deb package just only 1.5 M.